in a galaxy far, far away I bought a quilt pattern at Joann's. This was one of the first quilts I pieced in this house. Almost eleven years ago. I wasn't new to making quilts, but wasn't much for reading and following patterns. This one looked pretty straight forward. No curves. Easy math. I had a lot of fun finding fabrics and learned a lot making this top! I loved how soft and cottagey it looked when I finished it. Well, I got the top made and then moved on to much more interesting blocks and patterns I saw on quilting blogs, flickr and then Pinterest. It was a classic case of QADD. Remember me mentioning spring cleaning my sewing stuff? I found this top and decided it needed to come away from the dark side and get finished. I had chosen soft, cottage style prints and colors. 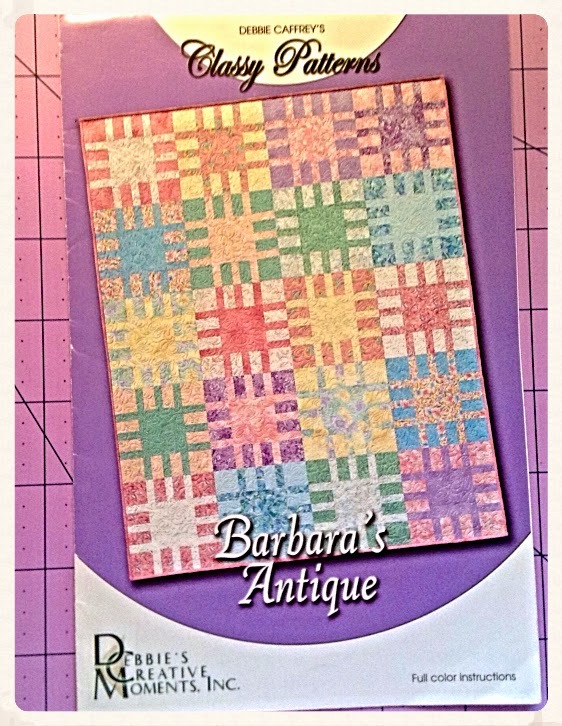 Some of my first purchases from "real" quilt stores are in here. A lot of my favorite cabbage rose prints. Beautifully vibrant blues. Soft as rainfall blues. Sweet lilac colored purples and tickle your toes pinks. Warm, happy, sunshiney and buttery yellows. Spring greens. Can you tell I fell in love with this quilt again? The original pattern had the blocks made from complimentary fabrics scattered throughout the top, but I remember not liking that look and deciding to keep the them together. This created a "four square" pattern. I bought some cotton batting and backed the whimsy with an old, soft sheet I had in my vintage linens collection. Straight-line, echo quilting around the inner boxes and fmq-ing the rest. While I was decluttering and cleaning, I found a white fabric with small white leaves to use for the binding. This quilt is heavy! I wanted to take another picture in the sunshine this morning, but someone was still snuggled up under it in their bed. Just didn't have the heart to wake him up. Good thing this finished out somewhere between a twin and full size quilt! Next WIP to work with is this strip of scrappy, mini-Swoon blocks I pieced in the fall of 2011. This was before the pattern for a smaller block had come out and I just improvised on the measurements. These finished out at around 11" sq. Thank you so much for your thoughts and prayers for us! My mom reads every comment on this blog. We really appreciate you. My dad, sister and I are tag teaming on doctor visits and radiation treatments. Knowing we are covered in prayer is a comfort and encouragement! t you just love finding projects like that and "Joy Of Joys" they still make you happy!! 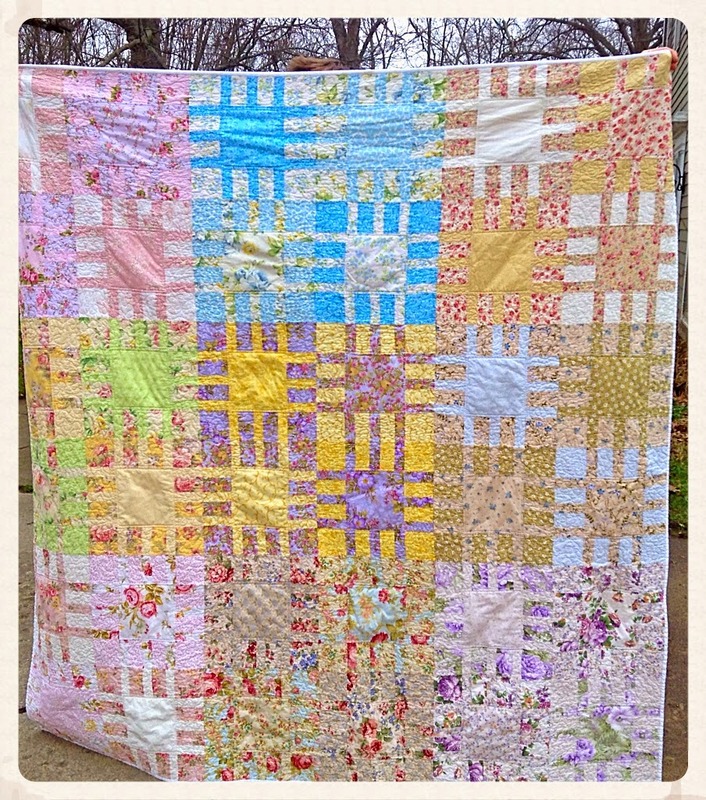 this quilt is lovely!! and the scrappy swoon is amazing.....is this scrappy with a plan or random pick a piece scrappy? Love the colors you chose for both of these projects. The first one has held up so well (I have unfinished projects started less than two years ago that I'm already tired of, but your top looks timeless)! The mini swoon blocks are amazing! 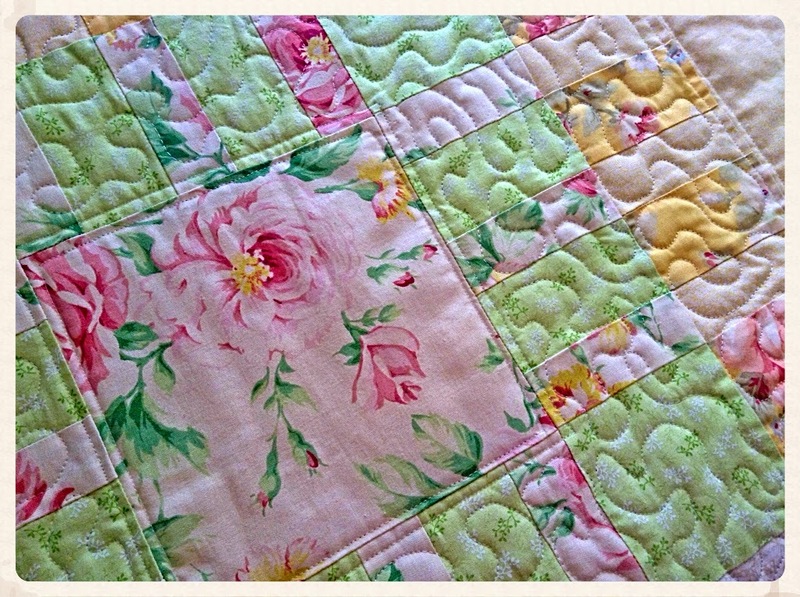 How lovely to fall in love with a quilt you had already done so much work on. It looks very pretty, soft sweet colours. I love that strip of swoon blocks with the strip pieced sashing! 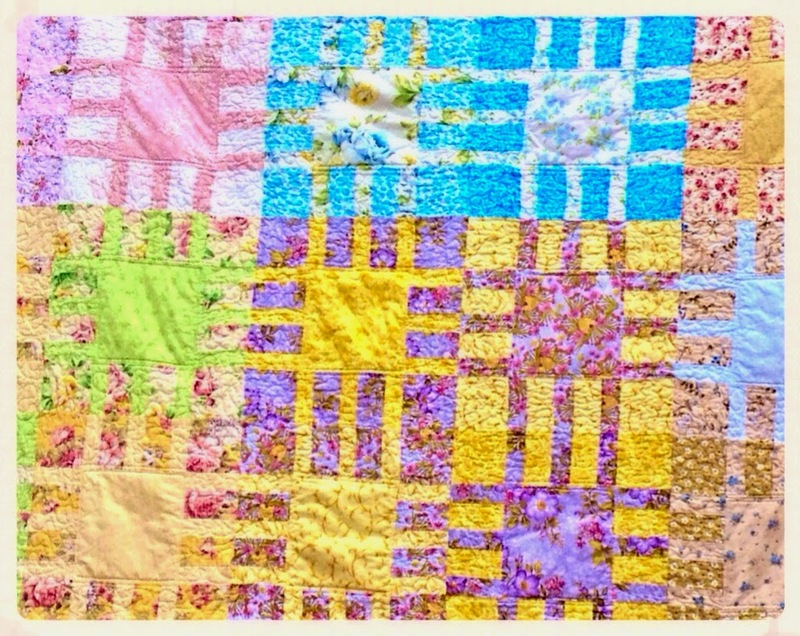 Your scrappy swoon blocks look great! Love hearing from bloggers wherever you are! watch those sewing machine needles, ladies! "For every soul, seeing Him in her own way, doubtless communicates that unique vision to all the rest."